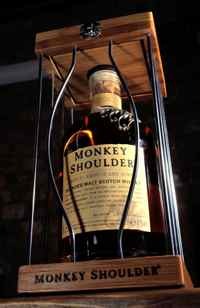 First Drinks, the UK distribution arm of William Grant & Sons, has announced the launch of a Monkey Shoulder gift pack exclusively to the prestige channel. The triple malt Scotch will be available in a cage gift pack in prestige outlets from June, later rolling out into the wider convenience, specialist and grocery channels in July. The Monkey Shoulder gift pack joins the First Drinks gifting range, which also includes packs for Glenfiddich, Grant’s, The Balvenie and Rémy Martin. Senior brand manager for Monkey Shoulder, James O’Connor commented: “Monkey Shoulder’s mission is to bring new people into the amazing world of Scotch by tearing down all the stuffy stereotypes and misconceptions that put younger drinkers o ff. The cage pack makes a great gift for those people who’re looking for something a bit different, and who might not normally think of Scotch whisky. The cage gift pack will initially be available in Selfridges, Harrods, Fenwick Newcastle, Harvey Nichols, The Whisky Exchange, Master of Malt, Partridges of Sloane Square, Soho Wine, thedrinkshop.com and The Wright Wine Company.